When our daughter moved to the East Village last November, we quickly discovered the many excellent ice cream places within a short walk of her place. And since we’ve now moved to an apartment a block away, these establishments are part of our neighborhood as well. I know ice cream can evoke strong feelings — check out the comments related to Richard’s post related to old favorite Santini and upstart Nannarella in Lisbon — and I expect this post to elicit supporters and detractors as well. Richard, Maddy, and I each have our tastes — and our favorites. We don’t always agree, and sometimes we argue about which place to patronize. And then the loser gets into a snit and doesn’t order ice cream at all. 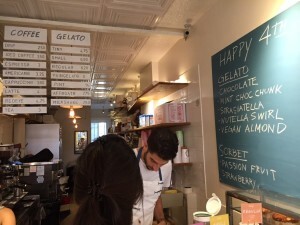 The Laboratorio del Gelato doesn’t have a menu. You have to go inside to see which of their more than 100 flavors are available. Since each of us does have a favorite, I will review these in the order I first discovered them. Thus, the story begins in 2003, back when my family lived in an Albany suburb called Clifton Park. I had been teaching Sunday School for four years already, and this was the first year my seventh grade class took its annual field trip to the Lower East Side. Maddy was in the class that year, and across from the Tenement Museum on Orchard Street, we noticed a small storefront selling ice cream under the name Laboratorio del Gelato. They mainly supplied restaurants, but the samples we tasted were outstanding. Over the years I made a point of visiting Laboratorio del Gelato and steering my seventh graders and their families there. One year, I was so successful that our field trip sold out the storefront’s stock. 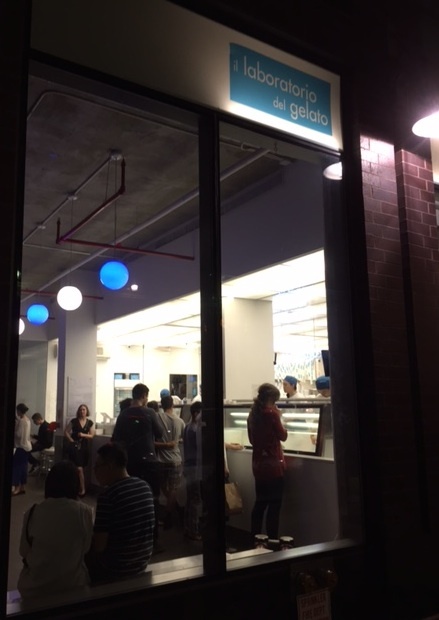 When a 23-story apartment building went up across the street from Katz’s Delicatessen on East Houston Street — another stop for our field trip — Laboratorio del Gelato moved into a much larger ground-floor space. Now “Lab del Gelato” is the largest of our five favorite ice cream purveyors and the one with the largest range of flavors that rotate as soon as the previous one runs out. I’m a fan of the Thai Chili Chocolate and the various cinnamon flavors. Richard favors the sorbets. The flavors are generally intense, though the “flower flavors” (lavender, lilac, etc.) are more subtle. There is a two-taste limit per person, but a large space and adequate staffing prevent long lines. Van Leeuwen’s Manhattan parlor on E. 7th St. between First and Second Avenues. 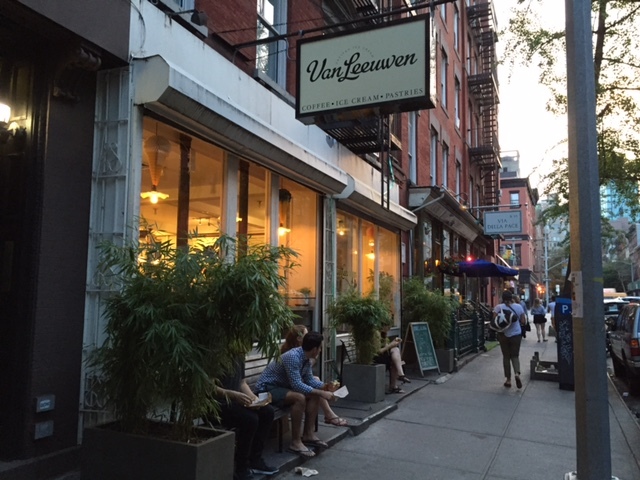 Richard and I first became fans of Van Leeuwen ice cream when we had our pied-a-terre in Hell’s Kitchen (a neighborhood bereft of decent ice cream despite its otherwise strong culinary offerings), and a small grocery store inside Gotham West carried it. Alas, the grocery store went out of business, and no one else within melting distance carried it. (Buying ice cream from distant markets in the summer can lead to disappointment.) From time to time we traveled to the parlor on East 7th Street, just east of Second Avenue, for a hot fudge sundae. The sundae offerings are varied and excellent, with top-notch fudge and fresh whipped cream. Van Leeuwen also has the best ginger ice cream we’ve tasted; they don’t skimp at all on the ginger pieces. The chocolate has a nice, strong flavor, as does the espresso ice cream. Vegan options are also available for an extra charge. The Van Leeuwen menu, which specializes in vegan flavors and ice cream concoctions such as sundaes and floats. The ambiance is old-fashioned ice cream parlor, and the air conditioning in summer is intense. Compared to the others, the portions at Van Leeuwen are a bit smaller for the price, so if you’re looking for value, this isn’t the place. Value seekers are better off at the friendly and lively Mikey Likes It on Avenue A and East 12th Street. We found the ice cream a cut below the five reviewed here but still tasty, and the portions are huge. My husband and daughter and I split a regular dish, and Maddy still took part of it home. 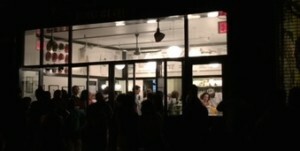 Long line at Morgenstern’s just before closing. Hope they all get in. 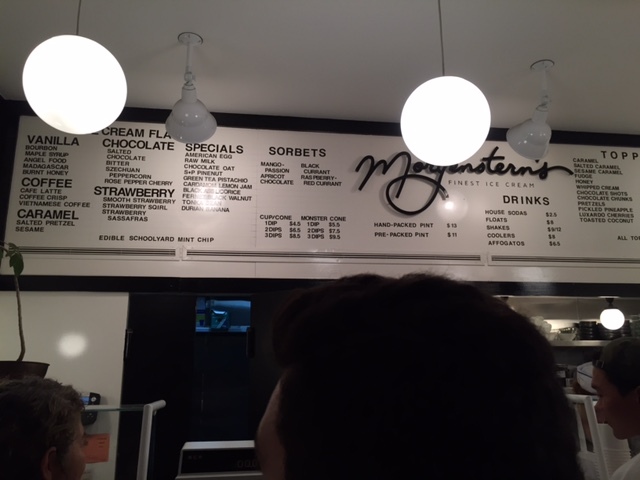 My husband’s favorite neighborhood place is Morgenstern’s, located on Rivington Street just east of Bowery. He isn’t alone; most summer evenings the lines stretch halfway down the block. On a recent evening, we waited half an hour to place our order and another ten minutes to receive our hot fudge sundae. Part of the problem is the combination of large menu with exotic flavors and less adequate staffing than Laboratorio de Gelato. Again, there is a two-taste per customer restriction. The menu at Morgenstern’s, where two tastes isn’t enough. In the case of Morgenstern’s, two tastes probably isn’t enough. The flavors are, in a word, unconventional. They run from the fairly ordinary coffee flavors latte (most milk), Vietnamese coffee (a little spicy), and coffee crunch (flavorful crunchies) to durian banana. For those unfamiliar with durian, it’s an acquired taste, and the smell (kind of like poop) and taste overpower the banana. In addition to the regular menu, the inventive ice cream makers of Morgenstern’s come up with all kinds of specials — both new flavors and things that one can make with ice cream. Maddy wakes up uncharacteristically early whenever they serve the breakfast of avocado ice cream on toast. Yes, it is worth giving up the extra hour of sleep. The hot fudge is also top-notch and especially welcome since the chocolate flavors (with the exception of a fortunately not-too-spicy rose pepper cherry) are not one of the parlor’s specialties. The Brazilian owner of A.B. Biagi uses colors and motifs from his country to decorate his NoLita storefront. Most of Richard and my disagreements on favorite ice cream spots have to do with Morgenstern’s and A.B. Biagi, which Maddy found on her way to and from work when she had an internship in Soho. Biagi is located in NoLita, on Elizabeth Street between East Houston and Prince. Both Maddy and I are huge fans of Biagi but for different reasons. She likes the Pain Gelato, which like Morganstern’s avocado toast, involves a combination of toasted bread and ice cream. In the case of the Pain Gelato, the bread is a sweetish brioche roll, and patrons get their choice of ice cream. I like the chocolate mint chunk ice cream, which all three of us think is the best example of that flavor in the entire city, featuring fresh mint with a slightly salty taste and shaved chunks (more like chips than huge chunks) of dark chocolate chips that melt in the mouth. The menu at A.B. Biagi includes a popular Pain Gelato and a more limited selection of flavors. Richard’s problem with Biagi is that he doesn’t like mint ice cream at all, and the parlor is one of two with a very limited choice of flavors. Still, limited flavors have their advantages. The ice cream makers focus on what they do best, and the lines are much shorter. About three customers can come out with cups or cones from Biagi in the time it takes one Morganstern’s customer to place and pick up an order. The portions are also a bit more generous, especially for those ordering cones. The sugar cones are a cut above as well. 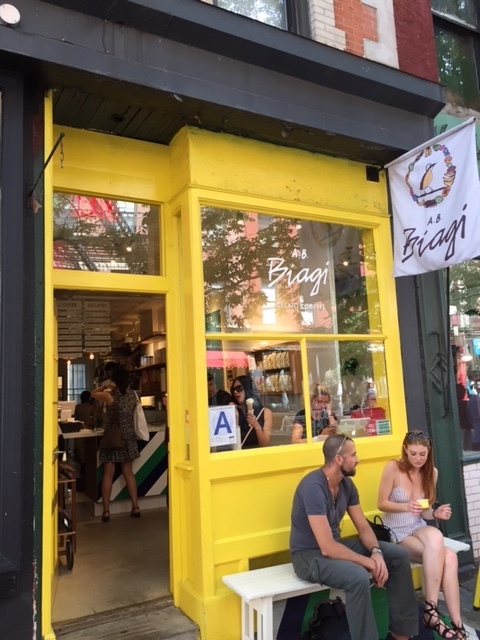 The owner of Biagi, António, comes from São Paulo, Brazil via Italy (where it seems that many of the best ice cream makers learned their craft), and the store is decorated with items from Brazil. Richard and I discovered Odd Fellows on East 4th St. between Second Avenue and Bowery while apartment hunting this past winter. Both of us passed the storefront at different times, as we were meeting at an apartment that turned out to be a bust. I thought it was too cold that day for ice cream. Richard disagreed, and after we left the apartment together, he told me what I’d missed. 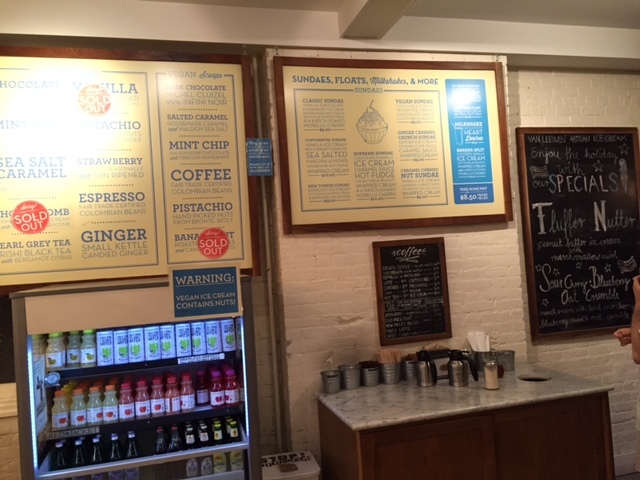 Odd Fellows’s forte is creative flavors of ice cream that change frequently. The cherry miso chocolate is one of his all-time favorites and a major contribution to New York City’s ice cream scene. Other standouts include ginger caramelized banana & walnut; white chocolate, black pepper & strawberry; and toasted almond coffee bean. The hot fudge is also excellent. Like Biagi, Odd Fellows has a limited menu in the East Village store with only eight flavors in stock — fewer if they run out. 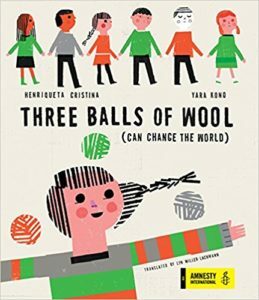 (The shop next to their Williamsburg, Brooklyn factory features more choices.) The flavor archive includes a hundred flavors, so it makes sense to check the website to see which ones are available on a given day. Visitors to the storefront can sample as many flavors as they want — a good idea because some of the many flavors can be total misses and everyone’s taste is different. That said, I didn’t find durian anywhere on the archived flavor list. What are your New York favorites? Let the arguments begin! I love neighborhood ice cream shops. Sounds like you have a lot to choose from in your neighborhood. We do, but we have to be mindful of our budget, so we don’t visit them as much as we’d like.